The mission of Elevate OT is to be a helpful, evidence based resource for Occupational Therapists, whether it’s through newsletter content, e-courses, or resources work. 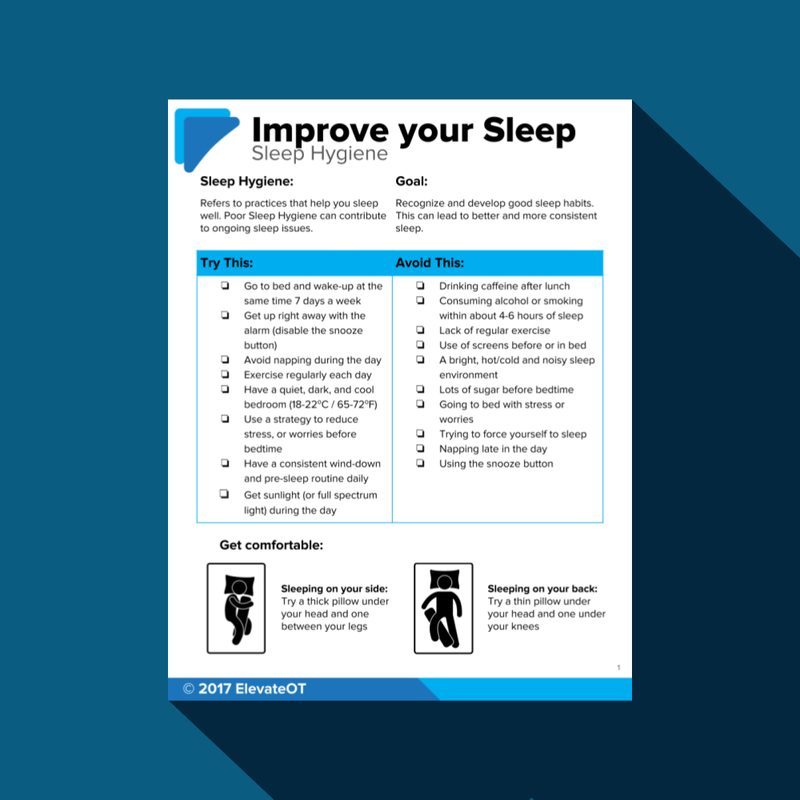 So with that mission in mind, we created a convenient, evidence based, CBT-I focused collection of easy to use handouts that help you quickly address patient sleep issues. The items are printable PDFs (15 pages total) plus a bonus spreadsheet; all are updated in 2017. 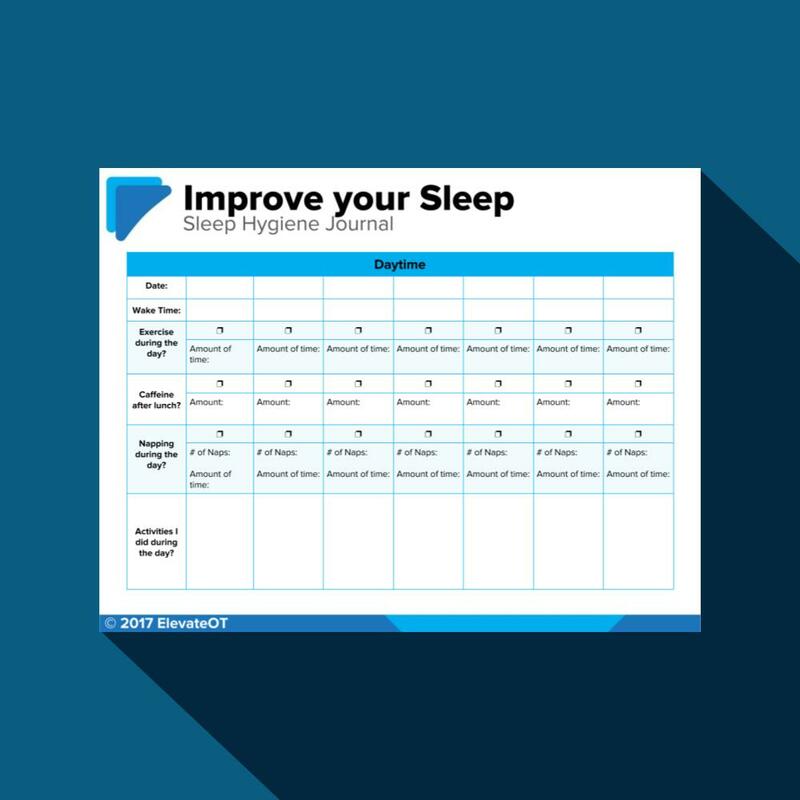 The Sleep Intervention Package is the bare essentials of the Elevate OT Sleep Course; perfect for those of you who are already confident in sleep theory, assessment, and science, but need evidence based tools to quickly and easily use in practice. CBTi based worksheets, handouts, and tools covering: Sleep hygiene; stimulus control therapy; sleep restriction therapy; and evidence based relaxation techniques for sleep issues. Bonus: List of literature use to create the pack to support your practice. The Sleep Assessment and Intervention Course takes it to the next level, with lessons covering basic sleep science, assessment, and intervention; perfect for those of you who are serious about transforming your ability to understand and deal with insomnia in adults.